The fourth rebel session went down at one of Kommetjie's famed outer reefs on Tuesday 27th September. Kissed by spring sunshine near perfect fifteen foot plus waves rolled in to the delight of the fifteen to twenty surfers in the water. The long period swell meant it was a bit slow at times but when the waves did come through there was some serious grunt to them. The usual crew of long time local standouts like Andy Mar, Mike Schlebach, Simon Lowe and Dave Smith were joined by big wave world tour title contenders Grant “Twiggy” Baker and Frank Solomon as well as up and coming big wave chargers like Josh Redman, Matt Bromley and fifteen year old max Armstrong. First time Outer reef inductee, 15 year old Max Armstrong discovered that even a slow day in this size waves can have some serious consequences. First Max’s leash came undone when he got caught by a set paddling out after his first wave and he had to double up with his father, former world big wave champion, Ian to go fetch his board. Undaunted Max paddled back into the lineup, saw someone backing out of a wave and, in his own words, “went quite late” and got smashed under the lip. Fortunately Max came out of the experience in better condition than his broken board and claims he enjoyed the experience and will “definitely be back for more”. 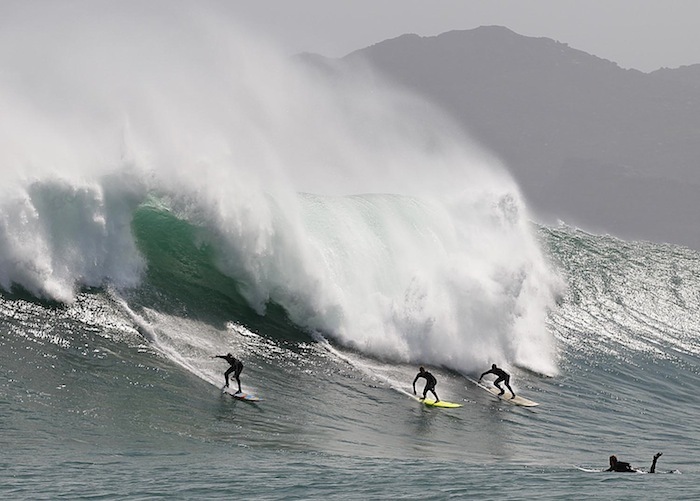 Once again the Cape Town big wave crew showed that its all about respect for the ocean and each other with lots of waves being shared in the crowded conditions and a great sense of camaraderie all round. At times between sets some of the crew got a bit too involved in there conversations and almost the entire lineup got cleaned up by the outside sets. By mid afternoon the wind had swung to the southwest and this, combined with the spring high tide sent most of the surfers to the bar to swop war stories. The relentless Grant Twiggy Baker was the last to give up paddle surfing and as the sun set it was just the tow in crews of Andy Mar with Simon Lowe and Paris Basson with Mike Baletta sharing the fading swell. The Rebel Sessions seeks to recognize and reward the best surfers riding the giant waves off the Cape Towns coast every winter with awards totaling R110 00,00 in prize money. The sessions runs from 15th July till 22 October.